Heidelberg Engineering prepares leadership team for the future | Heidelberg Engineering Ltd.
Heidelberg, Germany – Heidelberg Engineering GmbH announced today changes to the leadership team responsible to consistently deliver the company’s brand promise of excellence and innovation, supported by knowledge and confidence. Heidelberg Engineering’s new leadership team ­ from left to right in the front row: Managing Directors Arianna and Christoph Schoess, Krysten Williams, Andrea Ritter. Second row from left to right: Ali Tafreshi, Erich Bangert, Claus Gärtner, Dr. Tilman Otto, Kfir Azoulay. Having worked alongside the founders Dr. Gerhard Zinser and Christoph Schoess for over 23 years, Dr. Tilman Otto will continue to lead R&D. New to the leadership team, Ali Tafreshi who has served in sales, marketing and research capacities in both the US and German organizations for 6 years, will head up Product Management and Clinical Affairs. Dr. Gerhard Zinser carefully handpicked this powerful combination of technical and clinical talent to succeed him. After establishing the UK subsidiary seven years ago and growing into an important force in the market, Krysten Williams will move to the headquarters and support the Marketing and Education efforts. 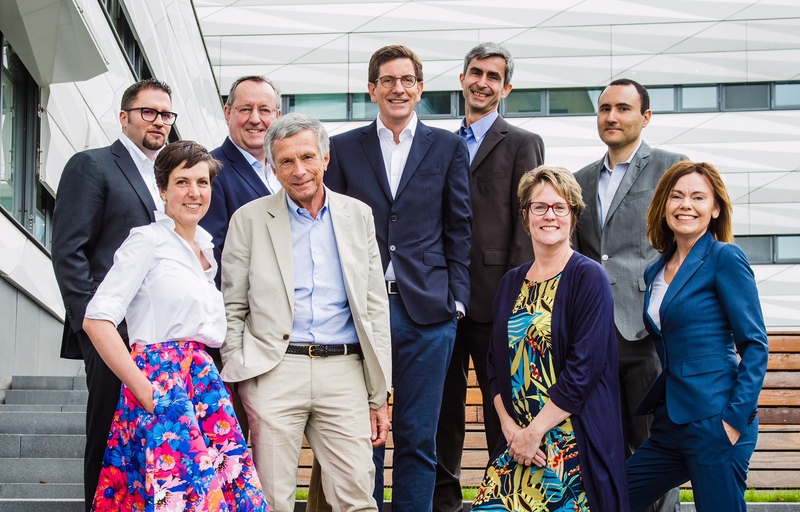 Ali Tafreshi and Krysten Williams will join Dr. Tilman Otto (R&D), Claus Gärtner (Finance, IT and Operations), Kfir Azoulay (Business Development and Healthcare IT), Erich Bangert (Sales and Customer Service) and Andrea Ritter (Human Resources) to form the new leadership team. In this context, the company has parted ways with Managing Director, Dr. Kester Nahen, and thanks him for his important contribution to the success of the company over more than a decade. Arianna and Christoph Schoess will continue to jointly lead the company as Managing Directors in a manner that will support the newly-formed leadership team in Germany to focus on key areas of the business and draw on individual strengths. As Heidelberg Engineering approaches 30 years of innovation in ophthalmic imaging and ownership passes to the next generation, Arianna Schoess understands the importance of fostering a positive collaborative environment to build a sustainable future for the company.